I know we are not supposed to have favorite children, but my painting Wash Day always makes me smile. 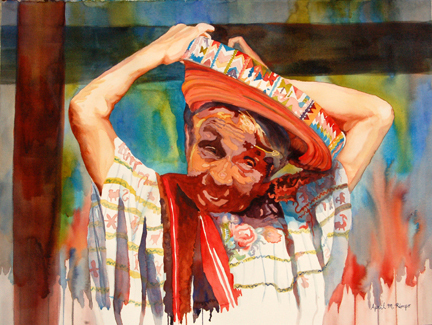 It is definitely my favorite Guatemala painting. As you can tell from the perspective, I saw the group of women washing their clothes in the lake from a boat. One man was watching from the shore (whom I decided to remove from the scene) and a few children were playing while their moms did the washing. I felt a sense of camaraderie among the women; this was wash day and they all were there. I loved the reflections of their skirts in the water. I'd seen women washing clothes in other places throughout Guatemala and when we had visited St Lucia years prior. I want to tell the story of Guatemala and this is an integral part of it. 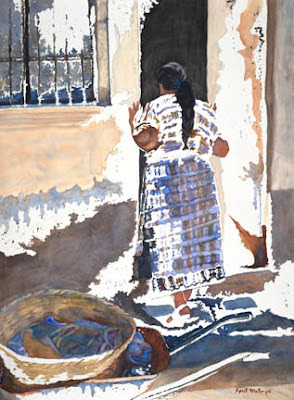 My goal in the painting was to capture the shape of the women and the bright sun spots on their clothes to ensure they were clearly distinguishable and the focus of the painting. I used a loose approach so the women were integrated with the water. I own a lovely painting Don Andrews did of three rodeo men where the men meld with the scene. I felt this approach would work wonderfully for the mood I wanted in Wash Day, so I kept Don Andrew's painting in my studio to remind me of my goal. 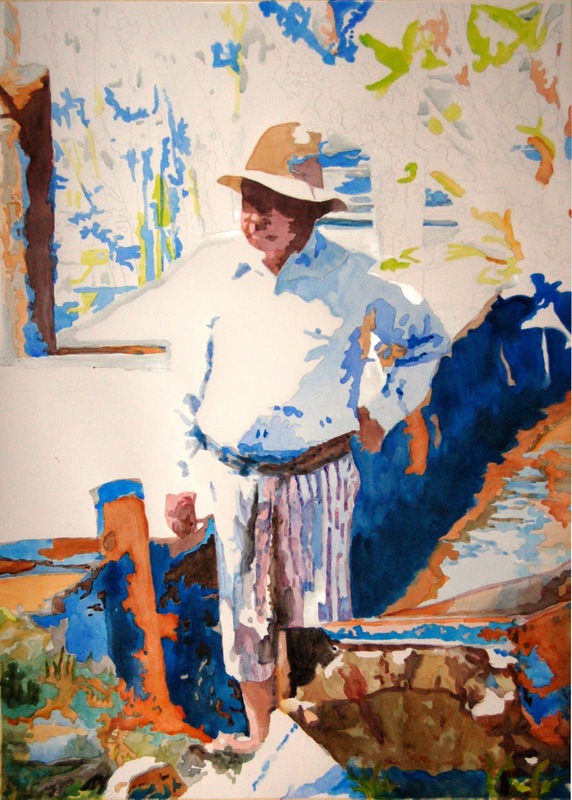 I also kept in mind Ted Nuttal's approach of applying very light washes and then adding dots and dabs of paint, which you pull out to soften edges and integrate the color into the scene. This technique worked beautifully to bring the color from the women's skirts into the water. I was delighted with the results and hope you enjoy it as well. 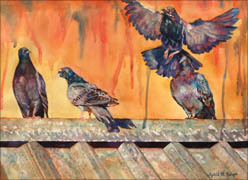 Over the years I've done several paintings that included pigeons as secondary characters. An oil painting done in the mid 1990s was my first. It was of my son when we went to Europe; he was about 6. He loved the pigeons at the various cathedrals. In those days they sold corn that you could feed the pigeons and he loved it when the pigeons swarmed in to get the corn, landing on you and trying to feed from your hand. My son was delighted. My next painting with a pigeon was Pigeon Keeper, which was based on an old photo of an uncle who had a pigeon coop when he was young. That painting was all about an interesting color design, but you can see an abstract pigeon on his shoulder. 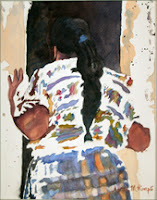 I wrote about this painting in my Color Schemes blog post. 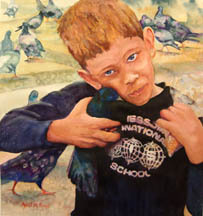 The third was a watercolor of my son with the pigeons in Europe called Pigeon in his Genes. See post Soul of a Portrait. In all of these the pigeons were supporting cast. I decided the pigeon deserved a painting of their own. They may be common and considered pests by many, but they do have beautiful iridescent feathers which are fun to paint. 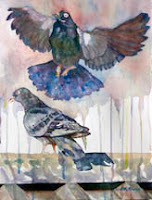 In Pigeons I I used a very different technique to paint the birds and they were more abstract, looking a bit like stained glass. There is also a Pigeons III and a study called Taking Flight. I think I'm finished with this pigeon series for now. 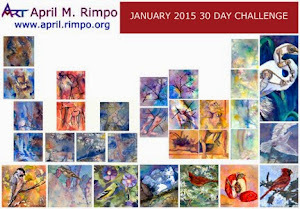 Below I've include small images of each of these paintings. A Favorite Color Scheme demonstrated in "His Dugout"
One of my favorite color schemes is a triad that uses primarily blue and orange with smaller hints of green. I use www.colorschemedesigner.com to preview the triad and zero-in on the shade of blue and orange that I want to use. Often the next step in my process is to use Adobe Photoshop to vary the colors in my reference photo(s) to try out my plan. The Photoshop version never looks quite like the final painting, but gets me close enough to know whether I want to go forward. 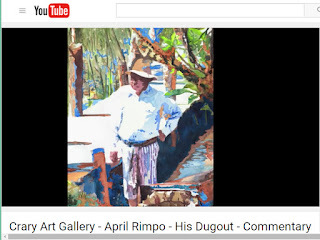 His Dugout is an abstract, representational painting that shows a Guatemalan man beside his dugout. 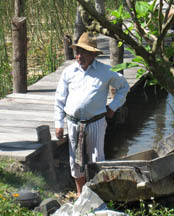 He was getting ready to repair the dugout using a molten, tar-like substance in his wooden boat. As I mentioned in my blog post on Basket Maker, few of the Guatemalan men wear traditional clothing, but many of them build and use these dugout boats. I'm sure I'll paint examples of these boats in the future. 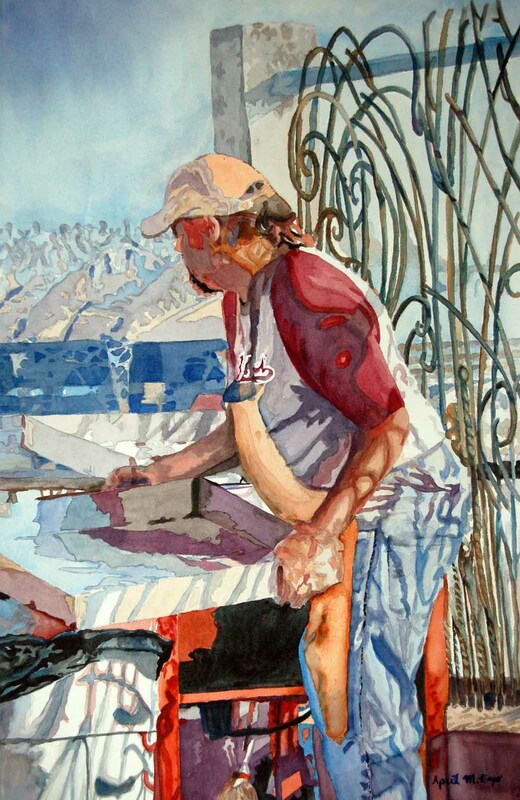 His Dugout received an Honorable Mention Award at The Pennsylvania Watercolor Society's 34th Annual International Juried Exhibition. 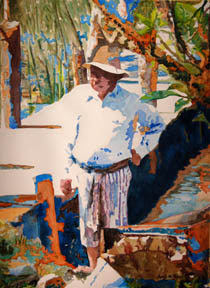 Many thanks to Pat Dews for selecting this painting for the exhibit and to Frank Webb for granting this award. Click the link at right to hear me discuss this painting. A picture of my source photograph before I manipulated it to push it to my desired color scheme. 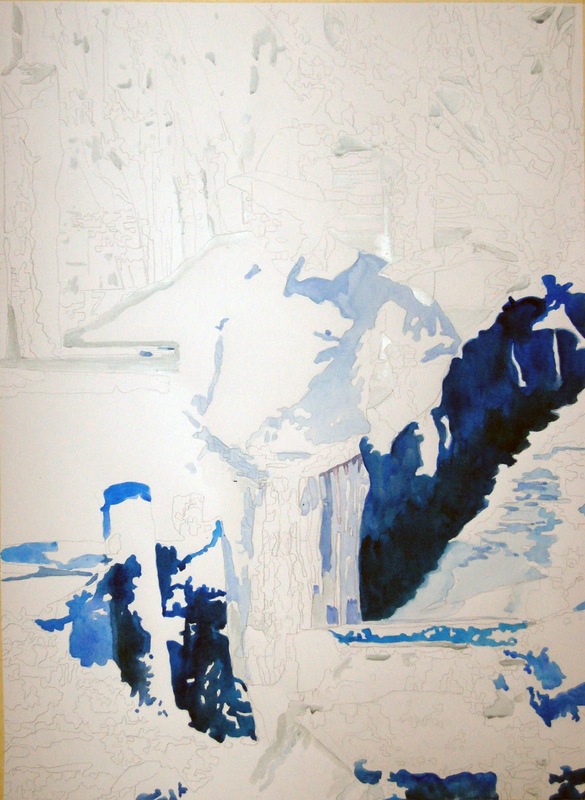 An initial work in progress (WIP) after lying in the first blues and establishing some of the darkest values. A later WIP photo after many of the orange hues had been added. The reception at Agora Gallery was an exciting time that left me exhausted. Having finally recovered I wanted to share the reception with you. There were three exhibits having their receptions at Agora Gallery that night: Sensorial Perspectives, Pathways to Abstraction, and The French Perspective. 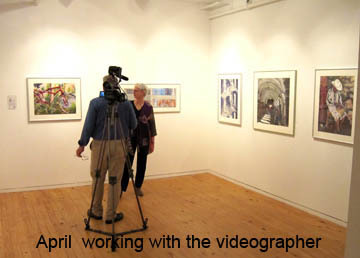 Before the crowds arrived, Agora Gallery's videograper, Crumlicmedia, worked with each artist to film us and our art. These individuals clips were compiled with filming done throughout the reception to create a video that you can see along with stills taken by the still photographer. Photos and a video of the reception I have borrowed a couple of the stills in this blog posting, but most of the photos were taken by my husband, Chas Rimpo. As you will see in these photos Agora Gallery is a large, beautiful space. Each artist's space included a bio with their work along with a Quick Response Code (QRC) that can be scanned by mobile devices to take you directly to the artist's sales site. 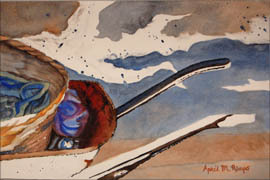 I had six watermedia paintings on display, some were only watercolor and others were a combination of watercolor and fluid acrylic. Five of the pieces can be seen in the picture with the videographer. The sixth, At One with their Gondolas, is in the first photo (above). 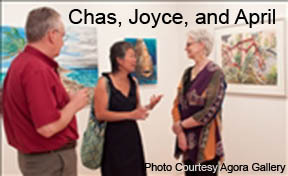 I spoke with several people during the reception, including Agora Gallery staff, clients, family, friends, and other artists. Below are photographs of some of the people I met during the event. I really enjoyed the work by Liesel Beukes, (take a look at her website) . 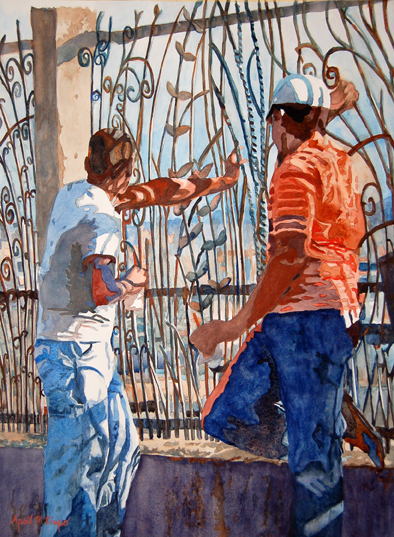 Her paintings are visually intriguing and thought provoking. 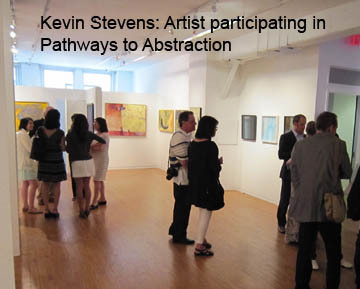 I also met Kevin Stevens who does abstract paintings; I loved the inclusions that represent moments from his life. He tells me he continues to explore a variety of media to learn and grow as an artist. My friend, Joyce, attended the reception with her daughter. It was great to visit. One of our nieces was in New York on her way to Europe, so we were able to visit with her as well. We were so busy talking we forgot to take her picture. I was fascinated by the mixed media work by Katherine Li . Unfortunately we were unable to meet her to ask about her process for creating this wonderful mixed media art. It had great depth and texture. Note: Chas and I took an Amtrak train to/from New York during which I took lots of photographs. We also took many photos while in New York. There are definitely some future paintings interspersed in all of this great material. Stay tuned. There is something about the mystery of Venice that attracts me. My family had the opportunity to explore Venice once. It was a very overcast, people were bundled up and ready for rain, but they couldn't resist the experience of a ride in a gondola. I had always envisioned these rides to be individual romantic rides, the Hollywood stereotype. The cluster of gondoliers traveling down the main canal altered my perspective. They really are taxis on the water, with charm. I wanted to emphasize the concept of togetherness and, at the same time, capture the idea that the gondoliers essentially blend into their boats allowing their passengers to enjoy their ride without interference. In "At One with their Gondolas" I painted the gondoliers in a way that you can't tell where their bodies end and their gondolas begin. I also joined the three gondolas on the left to make them seem like one. Using light values in the gondola poles they stand out, clarifying the separate boats and providing an interesting repetition. 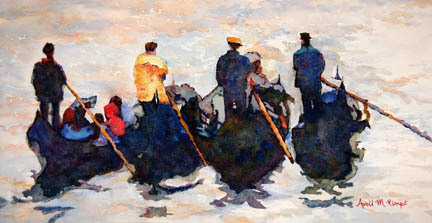 The fourth gondolier on the right is slightly separated and holds his pole at a different angle from the others, reminding us each gondolier is truly unique. 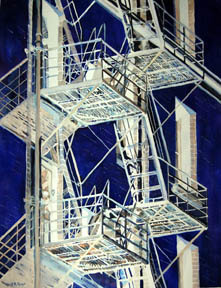 As is true for many of my city-scapes, Fire Escape is primarily about interesting patterns. Fire Escapes provide a natural repetition of pattern. The windows adjacent to the fire escape provided additional repetition. Fire Escape was also a play with negative shapes. Many watercolorists seem to be drawn to fire escapes as a subject for their painting. I had some photographs I had taken over the years, but every time I looked at them I struggled with how to do something different. I had cropped them into what I thought were interesting design patterns, but that was not enough. Finally I thought about inverting the values so the darks and shadows became the lights and the light colors became the darks. Once I started to play with that idea then I could focus on a color scheme for the darks without being caught up in realistic colors. It no longer mattered whether the building color was believable, since nothing was “normal”. At that point my color inspiration had been freed from the mundane. 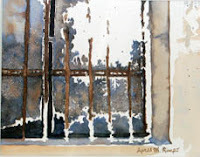 When I think of the city I think of pale blues and grays, but now I felt free to explore richer blues and purple tones. I wanted a restricted color palette so I stayed with an Analogous palette. Cerulean was only used in a few of the lighter passages and in the floor of the landings. I did branch out slightly from this palette in some of the lighter gray and beige passages.